Some animals give birth to young ones while some animals lay eggs which later develop into young ones. The animals which give birth to young ones are called viviparous animals. Those animals which lay eggs are called oviparous animals. The following activity will help you understand better and differentiate between viviparous and oviparous animals. The eggs of a few animals are easy to collect because their mothers lay them outside their bodies. These animals from which you have collected the eggs are examples of oviparous animals. But you would not be able to collect the eggs of a dog, cow or cat. This is because they do not lay eggs. The mother gives birth to the young ones. These are examples of viviparous animals. Oviparous animals undergo external fertilisation, while viviparous animals undergo internal fertilisation.The zygote undergoes rapid division after fertilisation and moves down the oviduct. During this period, many protective layers form as a hard shell around the developing embryo.The chick hatches from the egg after three weeks. The new individuals which are born or hatched from the eggs continue to grow till they become adults. In some animals, the young ones may look very different from the adults. Recall the life cycle of the silkworm (egg → larva or caterpillar → pupa → adult). Frog is another such example. 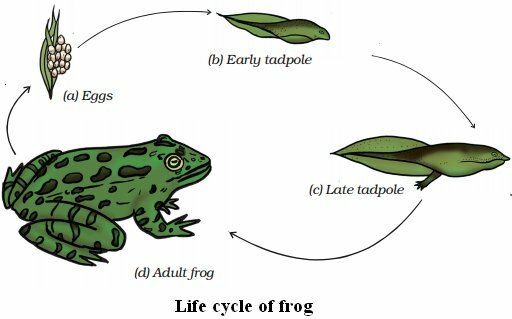 Observe the different stages of frog starting from the egg to the adult stage. We find that there are three distinct stages, that is, egg → tadpole (larva) → adult. Similarly, the caterpillar or the pupa of silkworm looks very different from the adult moth. The features that are present in the adult are not found in these young ones. Then what happens to the tadpoles or caterpillars thereafte. You must have seen a beautiful moth emerging out of the cocoon. In the case of tadpoles, they transform into adults capable of jumping and swimming. The transformation of the larva into an adult through drastic changes is called metamorphosis. What about the changes that we observe in our body as we grow? Do you think we too undergo metamorphosis? In human beings, body parts similar to those present in the adults are present from the time of the birth.  Animals such as human beings, cows and dogs which give birth to young ones are called viviparous animals.  Animals such as hen, frog, lizard and butterfly which lay eggs are called oviparous animals.